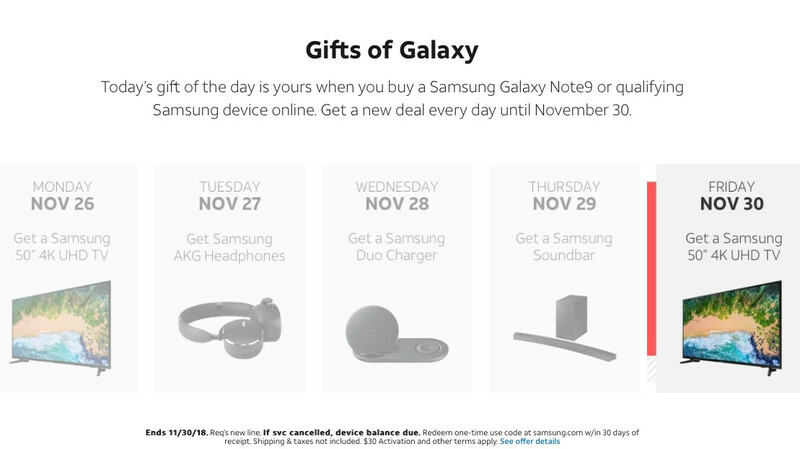 Today is the final day of AT&T’s sweet “Gifts of Galaxy” promotion, and to go out with a bang, the nation’s second-largest wireless service provider has decided to revive its best Cyber Monday deal. For just 24 more hours, Galaxy Note 9, Galaxy S9, S9+, and Galaxy S8 Active buyers can score an awesome Samsung 50-inch 4K UHD TV at no additional charge with minimal jumping through hoops. Namely, you’ll need to purchase one of the above-listed high-end phones on an AT&T Next or AT&T Next Every Year installment agreement, then remember to check your email within 14 days of buying an eligible handset, and redeem your one-time use promo code within another 30 days on Samsung’s official US website. Once those steps are completed, you can expect to receive a significantly more valuable gift at your doorstep than a Wireless Charger Duo or Gear Fit 2 Pro. We’re talking a big-screen TV with an ultra-high-definition panel, typically worth at least $330 outside promotional periods like this one. Unlike T-Mobile, AT&T doesn’t require you buy and activate a Note 9, S9, S9+, or S8 Active in a brick and mortar store to qualify for this final “gift of Galaxy.” But you will need a new line of wireless service or an altogether new account. The four flagship Android handsets on sale today (and today only) aren’t even that expensive with monthly installment plans. The Galaxy Note 9 can be yours for 30 payments of $33.34, while a Galaxy S9+ requires 30 monthly installments of $30.50 a pop. The GS9 and S8 Active are obviously even more affordable. Although this is probably not the end of the holiday saving season, you may not want to miss the opportunity of receiving a free 50-inch 4K TV alongside an already great phone.